Duluth, Minn. (26 January 2015) – On 25 January 2015, a pilot flying a Cirrus SR22 aircraft from the United States to Hawaii successfully deployed the Cirrus Airframe Parachute System (CAPS) over the Pacific Ocean approximately 250 miles from Hawaii. The whole-airframe parachute system, which is standard equipment on every Cirrus aircraft ever made, worked as designed and resulted in both the aircraft and pilot safely landing in the Pacific Ocean under the parachute canopy, where he was quickly retrieved by a passing ship with the assistance of the U.S. Coast Guard. With almost 6,000 Cirrus aircraft manufactured to date, the CAPS system has now been activated successfully 51 times resulting in 104 persons returning safely. Cirrus Aircraft’s Air Safety Team is currently assisting all authorities in the investigation into the cause of the incident. 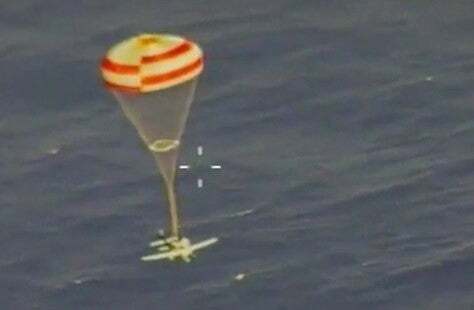 Video of the parachute deployment and subsequent rescue can be found here. Still image courtesy of U.S. Coast Guard District 14 Air Station Barbers Point. Cirrus Aircraft is a recognized leader in general aviation. Its all-composite line of personal aircraft – the SR20, SR22 and the turbocharged SR22T – incorporate innovative and advanced performance, electronic and safety technologies, including Cirrus Perspective™ by Garmin® avionics and the unique Cirrus Airframe Parachute System™ (CAPS). To date, total time on the worldwide Cirrus Aircraft SR-series fleet surpassed six million flight hours with 104 lives saved as a direct result of CAPS being a standard safety feature on all Cirrus aircraft. The Cirrus Vision SF50 jet, with over 550 production positions reserved, will provide a new personal and regional business transportation solution: the personal jet. All Cirrus aircraft are made in the U.S. with a direct sales force in North America and authorized sales centers covering export markets in 60 countries around the world. Cirrus Aircraft is wholly owned by China Aviation Industry General Aircraft Co., Ltd. (CAIGA). For additional information on Cirrus and its products please visit cirrusaircraft.com.